WFP Executive Director Ertharin Cousin speaks to a little boy in the Central African Republic during her visit in late March 2014. Racing against time and bad weather, prodding fickle donors and an indifferent general public, the United Nations World Food Programme (WFP) is working on all fronts to support millions of desperate people in the Central African Republic (CAR) and to keep international attention focused on the escalating crisis. The conflict in the CAR, where a 2012 rebel-led coup has given way to vicious Muslim vs. Christian reprisal attacks and massive human rights violations, has all the grim hallmarks of the world’s other crisis hotspots – Syria, where what began as anti-Government protests has, over the past three years, devolved into a civil war that shows no signs of stopping; and South Sudan, where a political rivalry exploded into full-scale conflict this past December, devastating the world’s youngest country. For all the needs in CAR, and they are enormous – the country’s economy has been wrecked, thousands of people have been killed, hundreds of thousands have been displaced, and 2.2 million, about half the population, require some form of humanitarian aid – the dire situation has failed to grab the media headlines or generate much enduring public interest. As the UN Security Council prepares to deploy a 12,000-strong peacekeeping force for the war-torn country, the most adventurous traveller will still have a tough time finding it on a map; the landlocked nation is nestled in the Congo basin, a volatile neighbourhood at the heart of the continent. Donors have generously provided more than $37 million towards WFP’s emergency response in CAR. However, the agency still requires nearly $70 million to carry out operations there up to the end of August, while in neighbouring countries WFP’s operations require a total of more than $17 million to provide food assistance to refugees who have fled the crisis. “We cannot let that happen. If we do, it will result in children who are already potentially malnourished, becoming severely malnourished. And women who need our support for food would go hungry. We could see a situation where we go quickly from food insecurity to severe hunger,” Ms. Cousin said. “We are working to get food to people,” the WFP chief continued, describing a complex operation that has already reached more than 400,000 people in the first months of this year. And while the plan is to get to 1 million people by the time the heavy rains start, WFP has, unfortunately, been unable to raise the funds required to purchase the commodities and preposition them in a way that will allow the agency’s workers to access communities that will be most in need during the rainy season when roads that are already barely passable become inaccessible. “The rainy season has already started. Light rains are happening right now. And when the heavy rains start in places like CAR, there are no all-weather roads,” said Ms. Cousin. “This is why we believe the time is now to tell the story of the people of the Central African Republic,” she said, echoing the theme of the agency’s recently-launched ‘CAR Can’t Wait’ emergency funding campaign that will match every donation dollar for dollar. Racing ahead of what could become an even more devastating humanitarian crisis, where “pictures of skeletal, severely underweight children document [the international community’s] failure and neglect,” WFP is using social media, international publications and other innovative methods to raise awareness among traditional and non-traditional donors about the need for immediate action. One key target for those donations will be to support people’s ability to feed themselves. That will mean doing everything possible to ensure that farming communities do not miss the current planting season. The success of the main planting season this month in the centre and the south, followed by the main planting season in May in the north, could be a critical turning point for food security in the country, where around 75 per cent of the population rely on small-scale agriculture for their food and income, according to the UN. Yet, a recent joint study carried out in the country by WFP and the UN Food and Agriculture Organization (FAO) revealed that between 92-94 per cent of those polled said that they do not have enough seeds or tools essential for the season. “We are working with FAO to distribute the necessary [supplies],” Ms. Cousin said, but added that FAO is also underfunded and has just enough resources to support about half the people who need seeds and tools. As such, WFP and FAO are distributing food as a part of the broader seeds and tools campaign. “These people have nothing; they left their homes and have no means of livelihood support. We want to avoid the temptation to eat the seeds to meet immediate food needs as opposed to planting them. This is just another reason why it is so important to get food into the areas outside Bangui to ensure that people who are planting have not just the ability to feed themselves in the future but also feed themselves today,” said Ms. Cousin. This of course spotlights another major challenge facing humanitarian agencies: the security situation. The road from Cameroon to Bangui is the only access route to get food into CAR. “That road is only driven with armed escorts. What we talked to the leadership of [African-led International Support Mission] MISCA about when we were there was ensuring that there is adequate support for transit for not just WFP, but also for commercial traffic to make sure there is food in the markets, as well as the food we bring in to support those in need of our assistance,” she said. 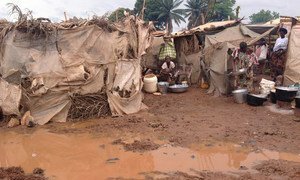 Against this backdrop of daunting challenges, marked by insecurity and chronic malnutrition, the Central African people, Ms. Cousin said, seem confident that their plight will turn around. “What hit me most when I was there was that despite the ongoing challenges that the people have gone through, they are still hopeful about their future,” she said.